Today, California’s governor signed a historic bill that will now ensure that no pet available in retail stores will come from overbred and often sick animals in mill situations. Furthermore, all pets in these venues will come from shelters and rescues, giving animals who have been impounded yet another spotlight and a chance at adoption. Governor Jerry Brown signed Assembly Bill 485, the Pet Rescue and Adoption Act by Assembly Member Patrick O’Donnell (D—Long Beach) Friday, October 13. The bill requires all dogs, cats and rabbits offered for retail sale in California to be obtained from animal shelters or nonprofit rescue organizations. The bill received wide support from legislators as well as the animal-advocacy community at large. The requirements in the bill take effect on January 1, 2019. The signing of AB 485 makes California the first state in the country to enact a policy of this kind and will dramatically reduce the trafficking of mill-bred animals into California pet stores. “We are overjoyed that Governor Brown signed this historic piece of legislation into law,” said Judie Mancuso, president and founder of Social Compassion in Legislation and one of the tireless advocates for the law. Not everyone is happy about the bill. The Pet Industry Joint Advisory Council (PIJAC)’s spokesman, Mike Bober, stated that the law will deprive consumers of protection when they buy pets, limit their choices for animals, and put jobs in the retail pet industry at work. The American Kennel Club said that the law fails to distinguish between legitimate breeders and people who profit from pets. Stormy Hope, Secretary of the Southern California Kennel Owners and Breeders Association, also expressed concern. The Paw Shoppe in Long Beach has for years featured shelter pets in their store at 6416 East Spring Street and does not share PIJAC’s concerns about the job or the health of the animals. 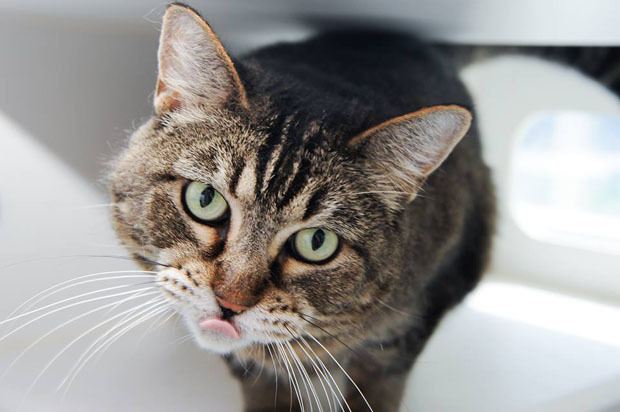 Sheena (featured with tongue) was up for adoption at the Paw Shoppe several years ago. Like most of the animals there, she got a loving home. Photo courtesy of the Paw Shoppe. Friends of Long Beach Animals began acting as go-between with the Paw Shoppe and the shelter. Only cats and rabbits are housed in the store, but Giallanza said that because they’re close to the shelter, they send prospective dog owners over if they come in looking for a dog. “And if we’ve adopted out the last cat or rabbit, they’ll bring another one down” Giallanza said. Being in the forefront of rehoming shelter animals in a retail venue, where it may be more comfortable for a client (and of course, pretty profitable, since all the pet needs are available for sale), gives the owners and staff a sense of pride. But being animal lovers as well as business people, they’re delighted about the passage of AB485. “We’re ecstatic,” Giallanza said. “It feels great to know that we’re up front!” Aaron Giallanza, store manager.